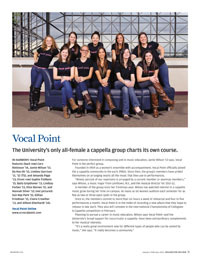 Vocal PointThe University’s only all-female a cappella group charts its own course. For someone interested in composing and in music education, Jamie Wilson ’13 says, Vocal Point is the perfect group. 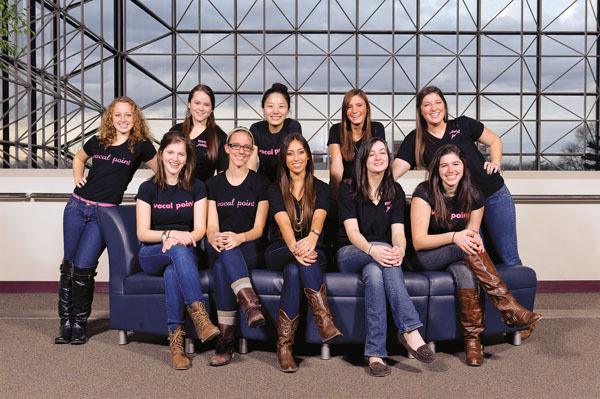 See profiles of the College’s a cappella groups. Founded in 1969 as a women’s ensemble with accompaniment, Vocal Point officially joined the a cappella community in the early 1980s. Since then, the group’s members have prided themselves on arranging nearly all the music that they use in performances. “Ninety percent of our repertoire is arranged by a current member or alumnae members,” says Wilson, a music major from Levittown, N.Y., and the musical director for 2011–12. A member of the group since her freshman year, Wilson has watched interest in a cappella music grow during her time on campus. As many as 60 women audition each semester for as few as two or three open spots in the group. Once in, the members commit to more than six hours a week of rehearsal and four to five performances a month. Vocal Point is in the midst of recording a new album that they hope to release in late April. They also will compete in the International Championship of Collegiate A Cappella competition in February. Planning to pursue a career in music education, Wilson says Vocal Point—and the University’s broad support for cocurricular a cappella—have been extraordinary complements to her musical interests.